The most valuable part of the legacy of the renowned Orientalist scholar is preserved today in the Eastern Collection of the Library of the Hungarian Academy of Sciences. 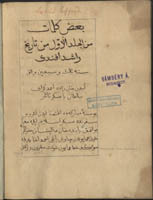 1 As Vámbéry’s work and questions determined the way of development of Hungarian Turcology, which would have not arrived at its present character without them, so the manuscript treasure of the Eastern Collection, the fundamental library of Hungarian Orientalist research also would be incomparably poorer without Vámbéry’s efforts and acquisition activity. Vámbéry’s role in the accession of the Library of the Academy and in the creation of the resource base indispensable to the Hungarian Oriental studies can be divided in two branches. The purchase of the Szilágyi legacy, which constitutes about half of the Turkish manuscripts of the Oriental Collection, was mainly due to Vámbéry’s intervention. Ármin Vámbéry met and befriended the 1849 emigrant Dániel Szilágyi (1831-1885) in Istanbul, during his first Eastern journey. Szilágyi, a cavalry sergeant – according to other data, a lieutenant – emigrated to the Ottoman Empire with Lajos Kossuth, the leader of the Hungarian War of Independence of 1848-1849, and remained there until his death. After the Crimean war he purchased in Istanbul the bookshop in which he previously worked as an apprentice, and from that time the shop became an important store of rare Oriental prints and manuscripts, not only for the Turkish reform intellectuals, but also for Hungarian Orientalists. Szilágyi purchased books and manuscripts for many of these scholars. 2 Vámbéry reported, that at the time they met, in 1857, Szilágyi “had a good command of the popular version of the Turkish language”, and when in 1864, on his return from Central Asia, they met again, “he had a reputation of an excellent Turkish translator”. 3 The difference in their habit of life and in their relation to science is well illustrated by the story, that when Vámbéry in 1858 published in Istanbul his first work, a Turkish-German pocket dictionary, Szilágyi did not want to talk him for a while. When his friend asked about the reason, the answer was: “You have committed an insolence, you make a show of your science to the world!” 4 This short dialog perfectly expresses the main difference between the two friends: Ármin Vámbéry became an integral part of Hungarian Oriental studies through his rich literary oeuvre, while the introverted Szilágyi, who was averse to writing, through the undying and unrepeatable result of his passion for collecting. However, the name of Vámbéry was intertwined with the Library of the Academy through his own donation, and this is the reason why his name figures on the marble plaque commemorating the patrons of the Oriental Collection. 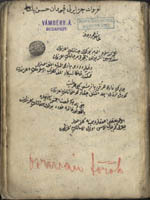 The identification of Ármin Vámbéry’s donations within the Turkish manuscripts of the Oriental Collection is often made easier by the stamp of ownership. On the other hand, the “Accessions of the library since 1870”, preserved in the old Archive of the Academy includes the donations and legacy of Vámbéry in an itemized form. In addition, the Akadémiai Értesítő also published a short title list of the received manuscripts. The latter, however, has to be corrected in some places. For example, the poems of Hafez were recorded twice, and they registered two copies of Nishandzhi’s historical work (Török O.376 and Török O.382), but later it turned out that the latter volume is a 18th-century chronicle by the court historian Mehmed Subhi. 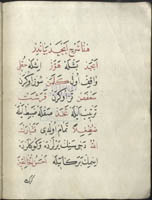 In addition, a lithographic copy of the mystical mesnevi Nan u halva, published in 1852 in Istanbul, was long recorded as a Persian manuscript (Perzsa O.48). 9 The manuscript legacy handed over by Rusztem Vámbéry consisted of 10 Persian, 2 Arabic, 43 Eastern Turkic and Ottoman Turkish items. This is a total of 48 Turkish, 10 Persian and 2 Arabic, that is, 60 Oriental manuscripts. In his autobiography, Vámbéry refers to his Eastern manuscripts as “the most valuable prey of his journey”, suggesting that he purchased the Eastern Turkic works during his Central Asian journey. 10 The majority of his Ottoman Turkish manuscripts were probably acquired through the mediation of Dániel Szilágyi. The catalog prepared by Kúnos already applied the current system of the manuscript collection, although it left much to be desired. A part of the deficiencies were corrected by another student of Vámbéry, Sándor Kégl (1862-1910), the first teacher of Persian language and literature at the University of Pest. The card catalog completed by 1909, which also included the new items of the increasingly growing collection, served for almost a century as the only usable index of the Turkish manuscript collection of the Academic Library, but in this hand-written form it could assist the researchers only in the local orientation, and it did not fulfill the most important function of modern printed catalogs, the access of the international research to the collection. The modern printed catalog, published in 2007 also in English and Turkish, 14 has contributed to a spectacular extent to the international recognition of the Turkish manuscripts preserved in the Oriental Collection, and in consequence the Turkish manuscripts of the collection could serve as a basis to several international source publications and research. The Eastern Turkic version of Mollah Kabil Seyyed’s mystical Remtinekli. The translator was Seyyed Mollah Muhammed Halim. Another exceptional item of Vámbéry’s manuscripts, the fable collection Feredzh bad esh-shidde, that is, “Joys after sorrow”. This genre, which akin to the Thousand and One Nights, is widespread in the Anatolian Turkish folklore, its origin can be traced back to the Arabic fable tradition. The forty-two short stories, different in content, are connected by their common end: in each of them an unexpected, wonderful turn brings solution for the actors in a hopeless situation. 4 Several manuscripts of this work are known worldwide. The Oriental Collection has eight copies, seven of which are from Dániel Szilágyi: Török O.6 and O.10 (originally one work in two parts, cf. Csorba – Sudár, 2003a, 132), O.33, Qu.3, Qu.4, Qu.5, F.48. 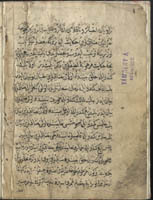 This manuscript of Vámbéry was copied by Hasan bin Muhammed el-Fumeni. Its exceptional value comes from its age: the manuscript, copied in 1451 in Edirne, is the oldest copy among the manuscripts known today. 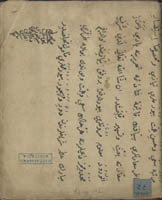 In addition, this work is also uniquely valuable from the point of view of language history, as an early written record of Ottoman Turkish language. The Oriental Collection preserves three copies of the 16th-century Turkish chronicle by Hodzha Sadeddin (Sadeddin Mehmed 1536/37-1599) (also Török Qu. 34 and Török F. 54). The author comes from an Iranian family established in Istanbul, a student of the famous Istanbul seyhülislam (chief mufti) Ebuʻs-suud. As the tutor of Sultan Murad III (1574-1595) and later as a seyhülislam he had an unmatched influence in the leadership of the Ottoman Empire. During the fifteen-year war, in the Battle of Mezőkeresztes (1596) it was mainly due to him that the losing Ottoman army did not break up. In 1598 he completed the chronicle “The crown of stories”, dealing with the period of the Ottoman Empire until the reign of Suleiman I (1520-1566). This manuscript was copied in 1609 by Mustafa ibn Iskender, and Vámbéry donated it to the Academy in 1858. A collection of letters from 1812. Educative fables in Latin and Turkish. Written by a European hand in the 18th century. An anthology compiled by a certain Ismail. Some parts are followed by a commentary. A collection of the popular, witty stories of Nasreddin Hodzha. A collection of calligraphic writings. 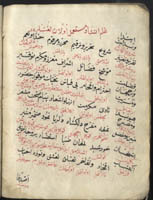 The flyleaf of this manuscript containing the 15th-century poem of Musa Abdi, has a note by Vámbéry: “I got this ancient Ottoman poetic narrative (Dzhamasp-nameh) on my 70th birthday from my erudite Turkish friend Nedzhib Aasim. Vámbéry”. A chronicle in verses on the deeds of Khan Sheibani (1451-1510), the founder of the 16th Uzbek Sheibanide dynasty, by Muhammed Salih (died in 1535). Sample letters for formal letter writing. A collection of letters written by several hands. This prosaic treatise, dedicated by the author to Sultan Ahmed III (1703-1730) deals with horses. The copier of Vámbéry’s manuscript was a certain Esad. A folk tale in Eastern Turkic. Incomplete manuscript. Religious poem by Hodzha Ahmed Yesevi (1093-1166), with which he wanted to promote the Islamization of the Turks. The author is also the name-giver of the mystic syncretist tendency founded by him. 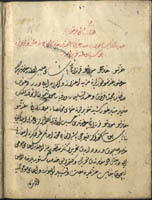 This copy of a 16th-century Turkish chronicle, containing also passages related to Hungary, was copied in 1673 by Abdullah bin Mustafa. Commentary of Hüsein bin Muhammed el-Hüsein to Ali Shir Nevai’s (1441-1501) work containing riddles and enigmas. 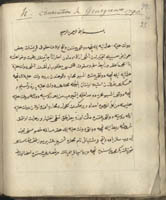 The collection of letters of Kani efendi (died 1791) was composed in 1809 by Mustafa bin Muhammed Sadik. This copy of Muhammad Huvayyi’s (Hoyi’s) dictionary was copied in 1619. A story in Eastern Turkic, based on a religious folk tradition. The Turkish chronicler Subhi Mehmed (ca 1711 – 1769) was court historian between 1739 and 1745. This work about the events of the 1730s and 1740s is an especially valuable source of the Hapsburg-Turkish wars of 1736-1739, in which Subhi personally took part. The prestige of this work, providing detailed information about the official events in the respective period (appointments, dismissals, other biographic notes) is further increased by the fac, that on several occasions Subhi used original documents. These stories on Mohammed and his companions were translated from Persian to Eastern Turkic. The narrator of this prosaic story in Eastern Turkic is Mesreb Shah. Mystical poems (mesnevi) by an unknown author. At the end of the work a short description of Sufism is included. According to the note on the flyleaf, the manuscript was offered as a gift by W. Nalivkine to Vámbéry. This Chagatai-Turkic reader’s dictionary was named after its first word. 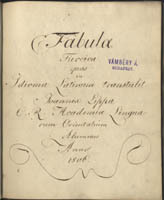 Vámbéry published its Hungarian edition in 1862. 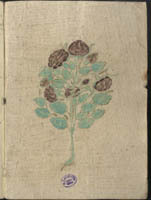 The Oriental Collection preserves three further copies (Ms. Török O.321, O.354, O.361.). A collection of fables written in various Turkic languages, copied by Vámbéry.